To the Great Bear Rainforest aboard a mothership - comfort and access. Luxury accommodation. Adventurous sea kayaking. 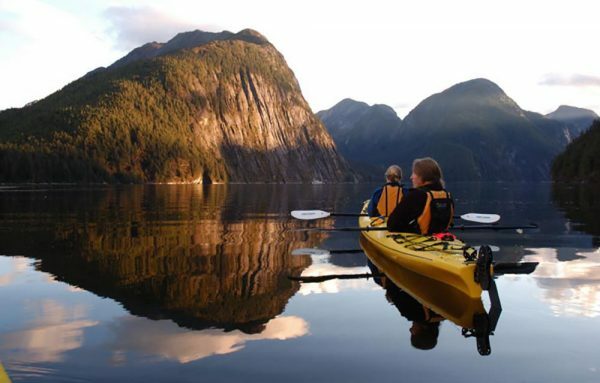 * Kayaking trips & tours are priced and charged in Canadian dollars; prices in other currencies can be estimated by clicking here. Prices are subject to 5% GST and optional $20 sustainability fee. Please see our terms and conditions for full payment and fees information. is your preferred tour date sold out? 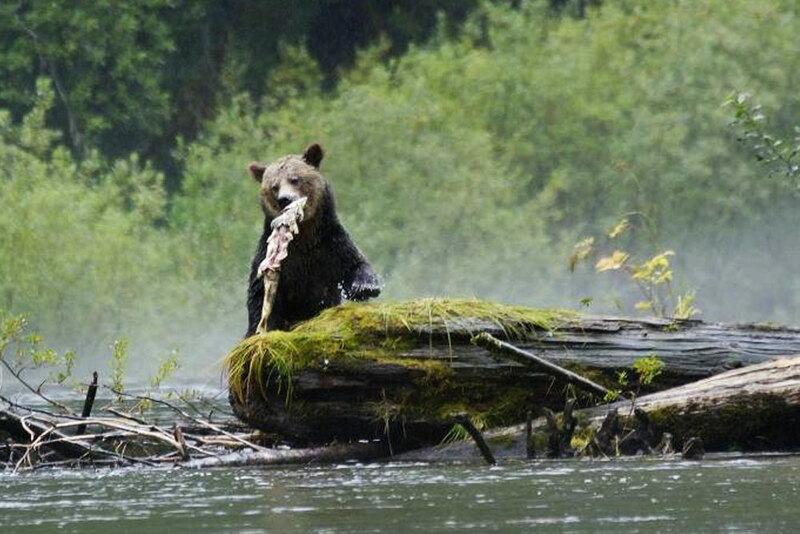 check out our other trip in the area, the Great Bear Rainforest Outer Islands Expedition. Set in the heart of British Columbia’s wild central coast, the Great Bear Rainforest and the Goose Islands offer some of the most stunning sea kayaking in the world. Departing from the remote First Nations village of Bella Bella, we begin our week of exploring the most pristine wilderness on the BC coast. The diversity of landscapes, abundance of wildlife, and unlimited paddling routes makes the Great Bear Rainforest a truly superb sea kayakers’ destination. Steep-sided glacier-carved fjords cut through the Coast Mountains on their way to the open ocean. Where the rain and snow fed rivers flow into these inlets, numerous species of wildlife congregate to feast upon the spawning pacific salmon who have returned to their place of birth after their lives as ocean dwellers. As we paddle in the river estuaries beside lush grassy meadows we often observe black bears fishing for salmon, eagles perched in the cedars, and if we are lucky, wolves loping along the beach. Towards the open Pacific the mountains give way to a maze of rocky islets dotted with exquisite white sandy beaches. Brightly coloured intertidal life clings to the surf-swept rocks while sea otters, seals and river otters play in the kelp beds and sea birds swoop overhead. Taking advantage of our kayaks’ silent travel and shallow draft we explore tiny coves and narrow passageways, while knowing that the warmth and security of the Columbia III are close at hand. With it’s vast distances, rugged terrain, and less predictable weather, the central coast is where the mothership concept truly shines. The options are varied depending on the weather and the desires of the guests. If the weather is fine a picnic lunch on a sandy beach or a grassy estuary is a lovely choice after a mornings paddle. Or, if the weather turns foul there is always the coziness aboard the Columbia III. Each day builds on the last as a true understanding and appreciation for the significance of this untouched wilderness evolves. 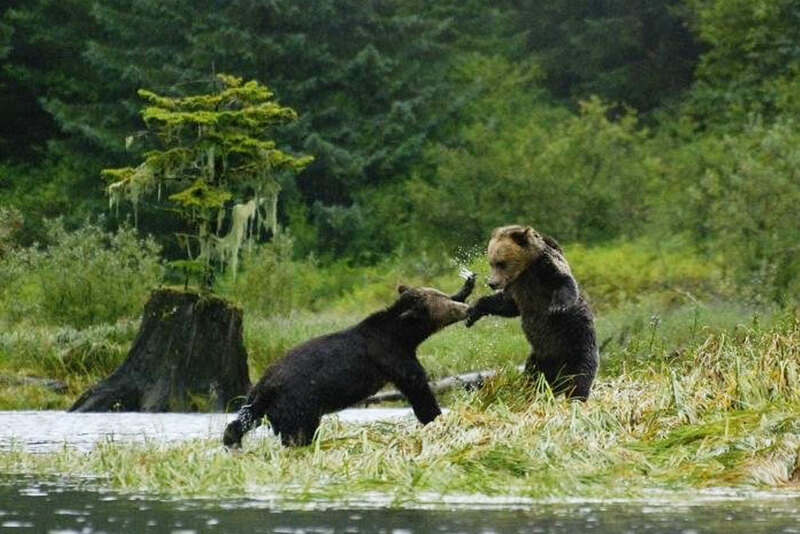 The Mothership Adventure in the Great Bear Rainforest starts and ends in Bella Bella. This journey takes us through a variety of fascinating and stunning locations among the outer coast and inlets of the central coast. 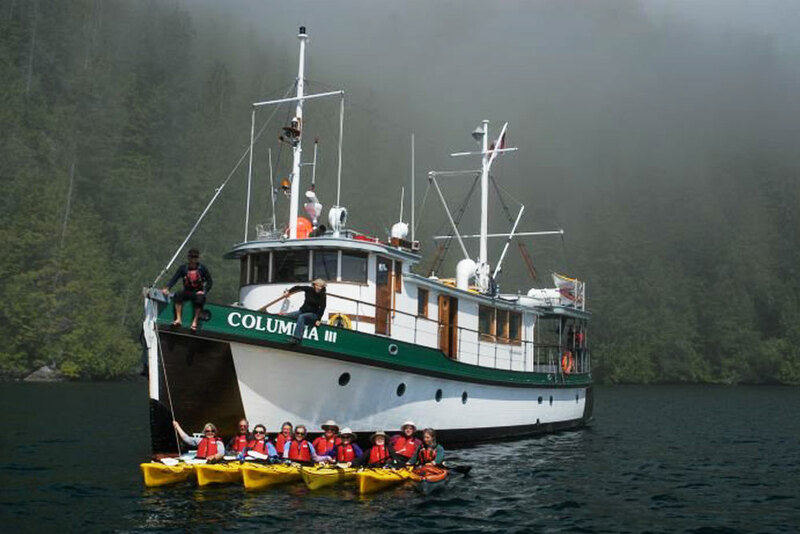 The Columbia III will be awaiting your arrival in the First Nations village of Bella Bella. 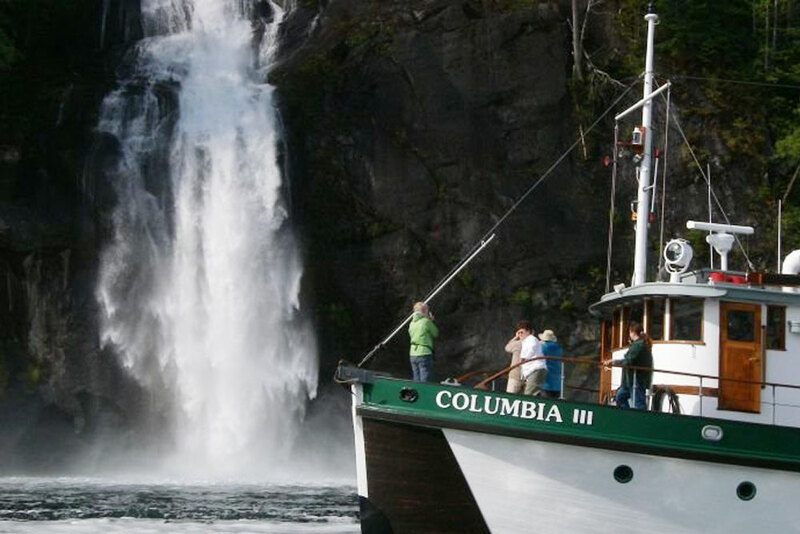 You will be greeted with a warm welcome from the Columbia III’s captain and crew as we prepare to cast off. Departure time aboard the Columbia III will be arranged according to the arrival time of the daily Pacific Coastal flight from Vancouver. (their summer schedules are not confirmed until April.) Once all our guest have boarded, we will cruise towards the wilderness of the Great Bear Rainforest. Each morning, after a hearty breakfast, we will launch our brightly coloured kayak flotilla and begin our day of exploring the spectacular beauty of the Great Bear Rainforest. Every day will bring a new array of stunning sights from the lush salmon-spawning river estuaries to the steep-sided glacial carved fjords and from the maze of exposed rocky islets to the exquisite sandy beaches. 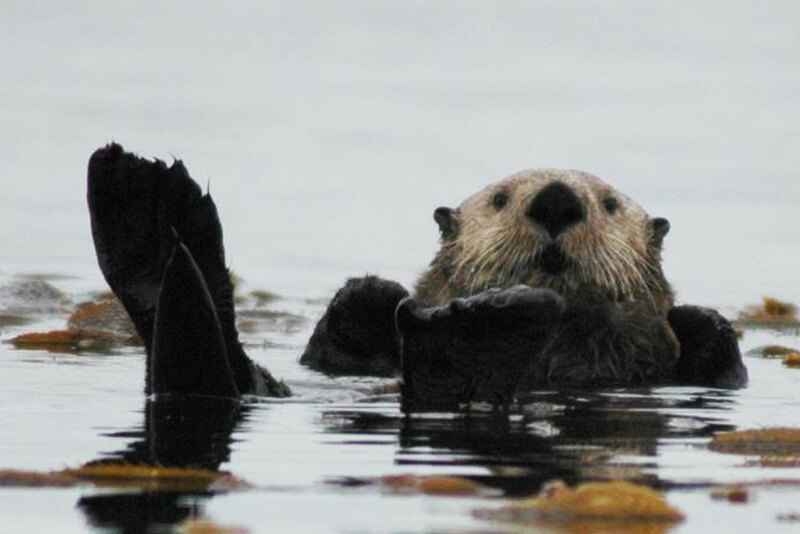 Wildlife we may be lucky enough to observe includes black bears, eagles, wolves, humpback whales, sea otters, harbour seals, and grizzly bears. Lunches will be savoured on a sandy beach or a grassy estuary before enjoying an afternoon paddle. 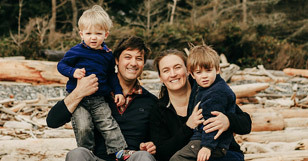 Other afternoon options include relaxing on the beach, exploring an estuary, cruising up a stunning inlet aboard the Columbia III or kicking back in the cozy cabin. 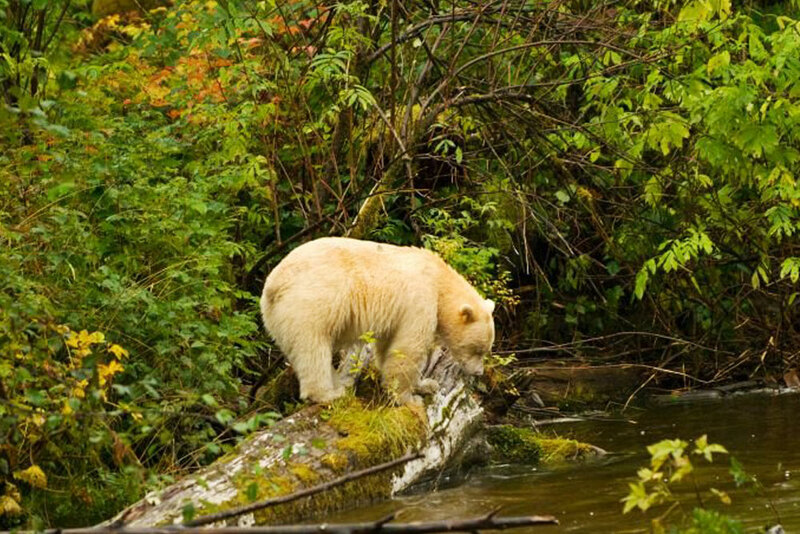 This is our last day to experience the peaceful beauty of the Great Bear Rainforest. The morning will be spent traveling back to Bella Bella, although there may be the option of a before-breakfast paddle for the early risers. Our return time to Bella Bella will again depend on the schedule of the Pacific Coastal flight back to Vancouver (mid day). How much kayaking experience is required to join one of the trips? No experience is required for our kayak tours! Our adventures are for everyone. Our trips are designed to cater to all levels of experience and abilities. The majority of people who join our tours are first time kayakers. All that we ask is that you welcome adventure with an open mind and are able to laugh and have fun when encountering the unexpected. Do I need to be in great shape to join one of the trips? No. Our adventures are not considered to be strenuous or physically demanding, and we do not require a high level of fitness. We just ask that you are capable of a few hours of moderate exercise each day. Keep in mind that good general health will go a long way if we happen to encounter some strong winds or time restrictions. Most important is an adventurous spirit. Spirit of the West caters to all ages of adventurers, and the mothership is an especially comfortable environment to base our explorations from. Although we do not have any age restrictions on our day tours we do prefer minimum of 12 years for our multiday tours. For those concerned with being in ‘their older years’, feel free to contact us to discuss your physical abilities. How much paddling is generally done in a day? Paddling time will vary depending on our destination, the groups abilities, and desires. Generally expect to be on the water between 3-5 hours a day. In our days activities we also like to incorporate some hiking, swimming, beach combing and of course leisure/lounging time. How stable are the kayaks? What is the likelihood of flipping over? The kayaks we use on our tours are stable and designed for comfort. Most of the time we travel in double kayaks, which are slightly more stable than the singles. The likelihood of a capsize is minimal, and generally only occurs in an uncommon situation. What happens if my kayak flips over? If for some reason your kayak flips over, all of our guides have ample practice time on the water with rescue procedures, in order to quickly and efficiently get you back in your boat. At this point we will take you to the nearest shore to change into some warm cozy clothing and carry on with our journey. While we are out on the water, it is of the utmost importance that the group sticks together in the event of a capsize or change of route plan. What if the weather turns bad? Will I be comfortable and warm? Our weather in the Pacific Northwest is generally pleasant from May through until the end of September, and the mothership as always cozy and warm at the end of a day. The temperature will vary slightly depending on which area you visit, but as Johnstone Strait and the Great Bear Rainforest is a little further north and more exposed to weather, these areas tend to have cooler temperatures. Although it is uncommon, it can rain in the summer. The rule of thumb is to be prepared for any type of weather and you will stay comfortable. Layering is the key, for at any time if you need to warm up or cool off while on the water, you simply adjust a layer. What sort of wildlife might we see on the tour? The diversity and abundance of wildlife in the Pacific Northwest is one of our privileges. With river run off from the mountains, ocean currents, tide rips, eddies and upwellings these waters are among the most productive on earth. 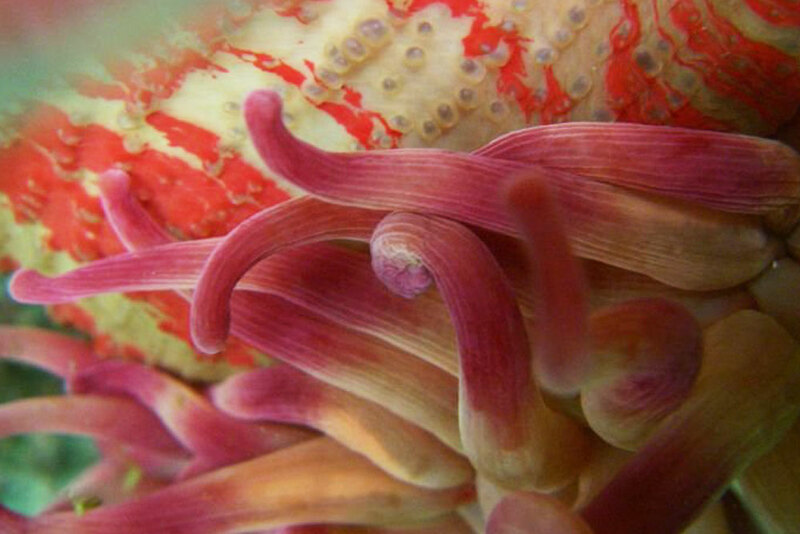 From the rich marine life of colorful plants and invertebrae, seabirds, shorebirds, waterfowl, mink, otter, seals, sea lions, dolphins, and whales, to the land animals of deer, raccoons, cougars, wolves and bears, we are bound to see something. For those with an eye for eagles take note that they are most prominent in the earlier months before the salmon migration in the late summer/early fall. 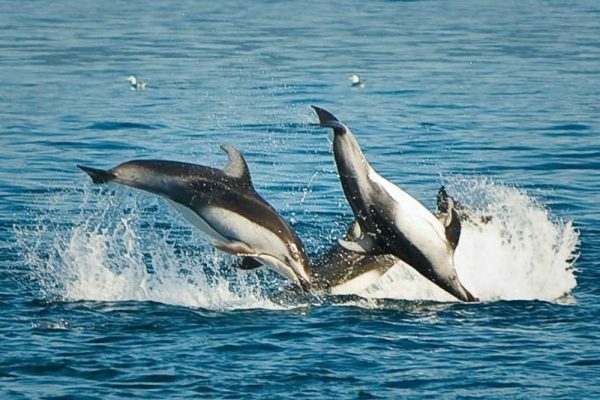 Depending on which tour you take, some areas offer more wildlife opportunities than others. Inquire if you would like to know what sort of wildlife you might see on your tour. What do I need to bring on a mothership tour? Our tours are all inclusive. We supply the kayaks and related gear (paddles, spray skirts, lifejackets etc. ), gourmet food, bedding and shower towels, plus wine with the evening meal. Please see our packing list for more details. Can I charge my camera batteries aboard the Columbia III? We have both 110 VAC North American-style plug outlets and 12 VDC cigarette-lighter style systems aboard with ample power for charging camera batteries and related equipment. Is alcohol provided or do we bring our own? We provide a couple of bottles of wine with dinner, but you may wish to bring a selection of your favourite beverages to enjoy (in moderation) in the evenings. What are the sleeping arrangements aboard the Columbia III? 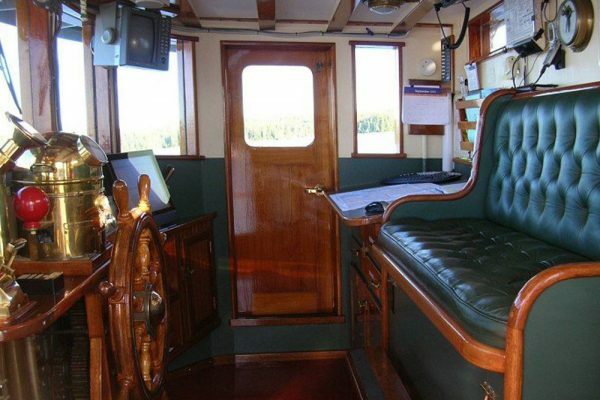 There are five private cabins which accommodate two guests each. Three of the staterooms have double beds for couples and two of them have single bunks for single passengers. There are three toilets and two showers shared between the five staterooms. Do I have to worry about getting sea sick? In general it is never a problem. On the Great Bear/Goose Islands tour we make one forty-five minute crossing (aboard the Columbia III) out to the Goose Islands where it can be a bit rolly, although we have never had anyone find it a problem. Is there the option to try a single kayak if I want? We carry one spare single kayak for just that purpose. Usually we start everyone out in the doubles, but as the week goes on, we can swap around so everyone gets to try what they want. "We shall never forget our week onboard Columbia III, exploring some of the planet's most beautiful terrain and viewing its fine inhabitants. Words do little to convey our appreciation of the wonderful hospitality and fellowship of the talented and dedicated Campbell family. We hope that we may return one day." "Thanks for an amazing week! The food, the wildlife, the guiding, the boat, the family - all as good as it gets! "We've just had the most memorable trip of our lifetime and appreciate being able to travel with your entire family. It was a wonderful way to be able to celebrate our 50th wedding anniversary a year in advance. The best whale watching!" "Thank you for as marvelous experience." "My appreciation of this experience is indescribable. Every tingle in my toes to the tip of my head are thankful, so very thankful for all your hard work and this wonderful genuine gift of your gorgeous west coast." "Thanks for an outstanding trip. The captain and crew were "above and beyond" to ensure everyone was happy. Great boat, great kayaks, great food, in the best place in the world. First class people running a first class operation. Highlight of the summer. Keep it coming." What to pack for a perfect Columbia III adventure. Although coastal weather is generally mild it can quickly change from very hot to cool and damp. For maximum comfort, preparation is key. A layering system of clothing works best, and waterproof raingear is essential. Avoid cotton which can stay wet for a very long time and therefore may not be comfortable. The new quick-dry clothing available at outdoor stores is ideal for kayaking along with fleece garments for warmth. When aboard the mothership, comfortable casual clothing of your choice is appropriate and often nice to change into after a day outdoors. When getting in and out of a kayak at a beach your feet will get wet. We suggest a sturdy pair of Teva type sandals or water shoes. Sports gloves for paddling may add to your comfort and help prevent blisters. Proper protection from the sun is absolutely essential. The sun’s reflection off the water can be very intense. Sun glasses, a sun hat and sun block (including lip screen) are all important. Bring a water bottle. Staying hydrated in the outdoors is very important. Consider bringing the items listed on the packing list that we provide. Because of the isolated nature of this adventure we will not be near towns or stores. A 10 ltr. dry bag found at most outdoor stores is perfect for carying your camera in the kayak. Please bring your things in soft, duffel-type bags… not hard suitcases or frame packs, as boats are not designed for such shapes which are awkward to stow. To book your trip aboard our mothership the Columbia III, please email or call our office and we would be happy to assist. 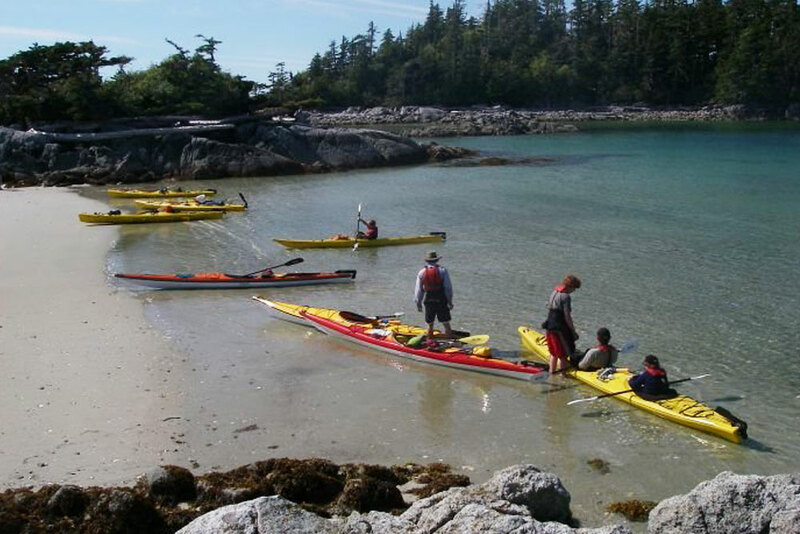 Affordable and inspiring paddling in the realm of the killer whales. Kayaking and basecamping in the realm of the orcas. Whales from the hot tub! 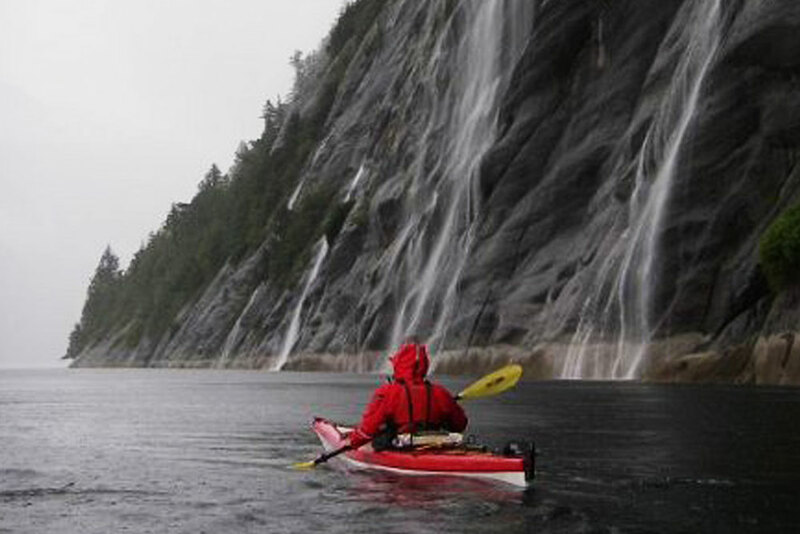 A true kayaking expedition on the wild coast of the Great Bear Rainforest. Warm-water paddling against the towering Coast Mountain Range of BC.